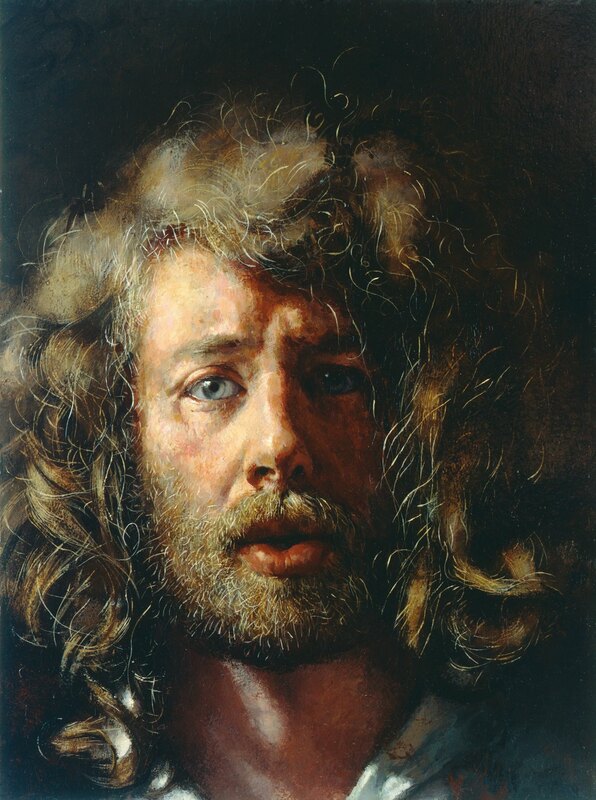 Lenkiewicz wrote in 1988: “The painter paints this look that summons him: he stares at it; he compels it to appear before him. This painted look is no vacant stare; it isn’t the look of waiting that a pose held so often puts on a sitter’s face. The look the painter is painting on the canvas is that of the painter in the act of looking; it is the look that only a few moments before was searching the mirror. On the easel the portrait is finished. The painter looks at the portrait, at the mirror; at the portrait, at the mirror, mirror and portrait are similar – the look and disposition of the face in each are alike. Then, maybe, this labour complete, the painter gets up and returns to its usual place the mirror he has taken the time to paint. The portrait remains, an authentic copy, a surrogate for the mirror now removed. The portrait is a record of the mirror; ephemeral and mobile, the reflection is frozen. The portrait looks at the painter. Painted in what was present time, the portrait watches the painter grow older, the portrait watches the face it once was become wrinkled with age. Indifferent, the portrait watches time, which from day to day discovers death.